Entry by lambdadelta on Wed Aug 14 08:22:24 2013. Attack on Angel? Shingeki no****o? 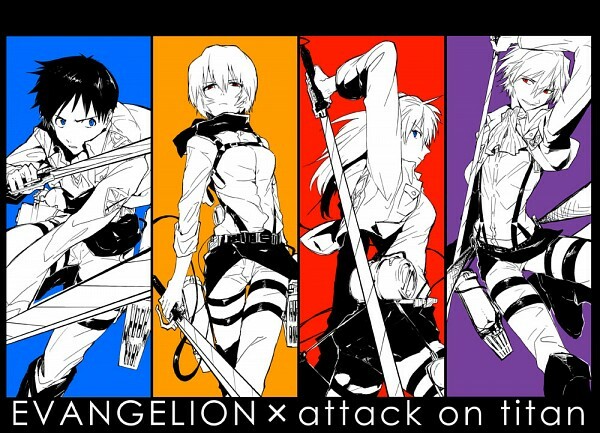 Asuka must be Levi. Shinji is obviously Eren. ^ Kaworu has the "frilly collar" that Levi wears, so Kaworu is Levi. Not too sure about Asuka though. And Asuka can't be Armin... Well, ok, she's blonde (Strawberry blonde(You can go to her info)) and blue eyed. I dunno I'm pretty sleepy to think about any similarities between the two. Rei as Mikasa is perf... Rei in the scouting Leijon uniform is hot. waifu.